STD 3 ¾" PREM XL 5 ½" JUMBO 8" 4oz. 6oz. 8oz. 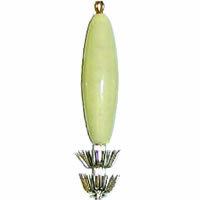 STANDARD (#000113) Our Most Popular Squid Jig! 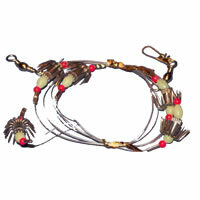 String Several Together To Catch Arrow Squid - A Must For Every Tackle Box. PREM (#050019) Standard Size For Normal Squid. XL (#050057) Perfect For Those Larger Squid. WEIGHTED STD 4"-4oz. (#050026), 4"-6oz. W/XL HD TINES (#050064), and 6"-8oz. 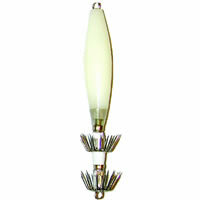 W/XL HD TINES (#050033) Great For Catching Squid In Strong Current Conditions. 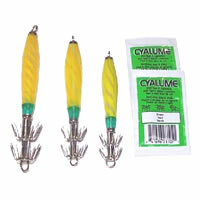 Izorline Lighted Squid Jigs come with 2ea Cyalume Light Sticks. Comes in Standard, Large and X-large sizes. 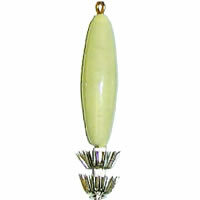 Izorline introduces it's new MULTI-HOOK SQUID BAIT CATCHER. 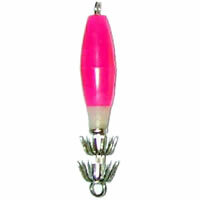 Izorline's new squid bait catchers can retrieve 5 or more arrow squid in one drop! 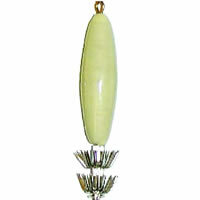 Available at finer tackle shops, along with the other fine squid jigs and weighted squid jigs from Izorline.